As little as a decade ago, artificial grass was a joke. Stiff and ugly, it was an unconvincing lurid green substitute for the real thing. But now it’s a whole different ball game – great for playing football on. There has been a vast improvement in terms of quality, colour and even the feel, which has seen its popularity grow exponentially. It has even been given the seal of approval by home décor and gardening programmes on the television. An increasing number of home owners are swapping their lawns for artificial turf. It’s easy to install, low maintenance – you can put the lawn mower out to grass. It offers a soft landing for children, will look as good as the day you put it down, and if you have pets, it can even cope with dog urine, which leaves ugly yellow patches on the real thing. To keep it looking pristine, all it takes is the occasional brush and a regular hose down. Even in the depths of winter it can be used non-stop, with no muddy patches where real grass would have worn away. 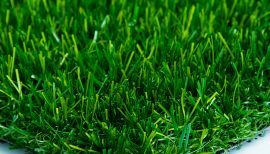 So if you have young children who like playing outside and you hate mowing the lawn, then t he latest generation of artificial grass is ideal whether your garden is large or the size of a postage stamp. Get in touch to find out our range of styles and colours and enjoy your garden 365 days of the year.